Christ Church, regarded as one of the finest examples of of Georgian Colonial American architecture, was built between 1727-44. Its steeple (BG-L), containing a set of eight bells, (increased later to eleven) was completed in 1754, and partially rebuilt in 1908 after a fire. Rising to the height of 200 feet, it long dominated the city's skyline. 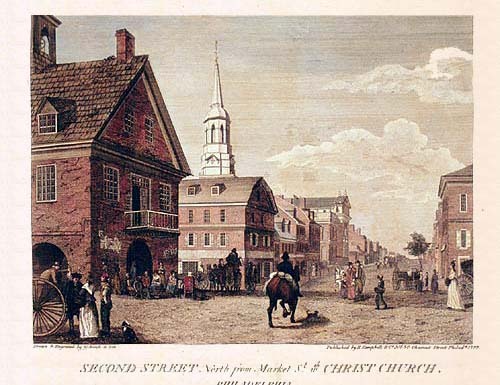 Both George Washington and Benjamin Franklin worshiped in the church as did many of the city's most socially prominent persons. Washington and his family occupied a pew that was originally known as the King's pew, later designated for presidential use. Besides Franklin, six other signers of the Declaration of Independence were members of the church: Robert Morris, James Wilson, Benjamin Rush, Francis Hopkinson, Joseph Hewes and George Ross. The dynamic Rt. Rev. William White, who was consecrated Bishop of the Episcopal Church of Pennsylvania in 1787, was rector from 1779 to 1836. Under his leadership the "General Convention of 1789" assembled in Christ Church and established an independent American Protestant Episcopal Church within the Anglican Communion. It adopted its own constitution, canons and version of the Book of Common Prayer. 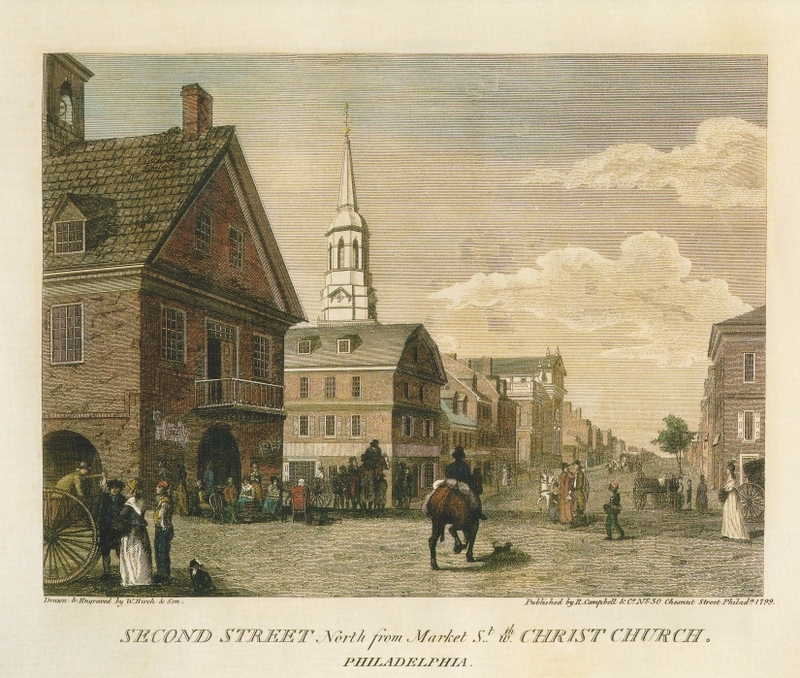 Bishop White was the first president of the Philadelphia Sunday School Society founded in 1791. The Town Hall or Courthouse (FG-L) was built 1707-10 and demolished in 1837. Its arcaded ground floor was the city's first permanent market. Combining a courthouse with a market continued a medieval custom. 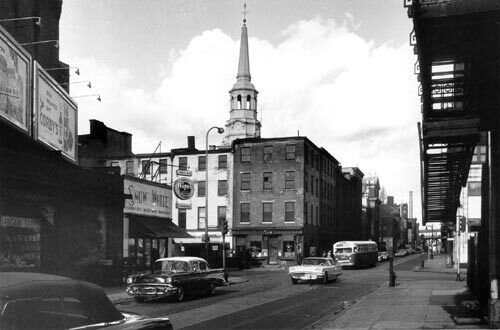 Buildings on the north side of Market Street and the west side of Second as far as Christ Church (MG-C 1960) were demolished in 1963 revealing a new and striking perspective of the church. . The resulting open space (MG-C 2000) is named James Wilson Park for the signer of the Declaration of Independence and member of the church. That small park and Christ Church are part of Independence National Historical Park, but the church is owned privately, not by the federal government. 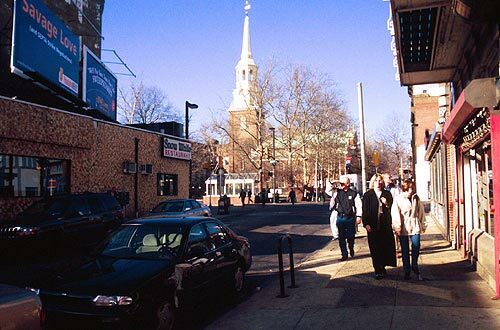 It is in the "Old City Residential Area" (created by ordinance in 1990), wherein only "compatible small scale commercial " establishments are permitted (see commentary, Plate 10). Specialty shops, clusters of upscale galleries, and the Arden Theatre have located in the "Residential Area."